I really do not have much to say about this dish except that it is deliciously simple and you really should prepare it. 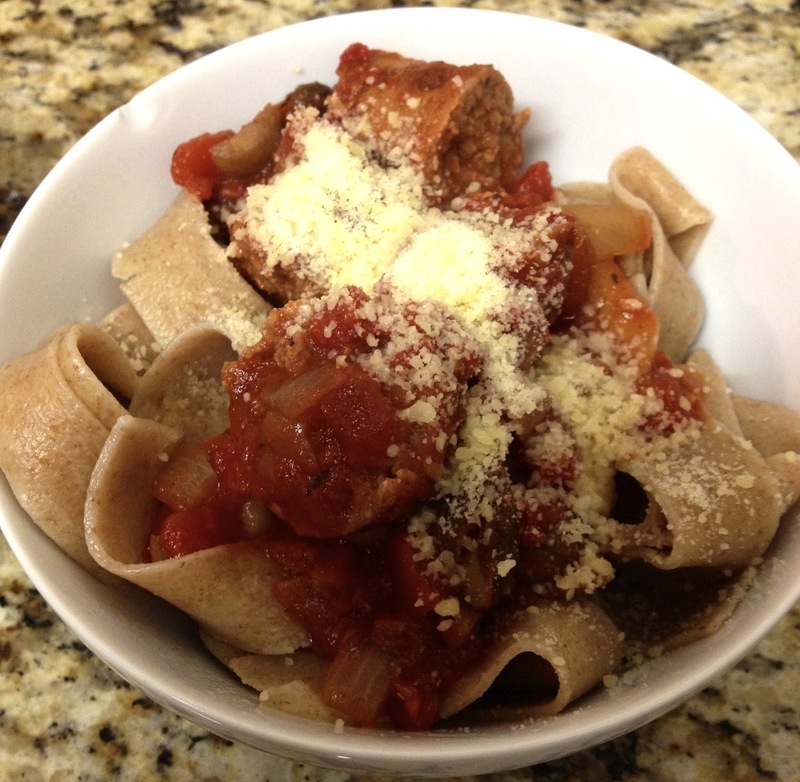 The sausage and mushroom sauce can be used with any type of pasta, but we really liked it with our whole wheat toasted onion pappardelle. The specialty pappardelle pasta and san marzano tomatoes gave the dish a weekend elegance. Heat a tablespoon of olive oil over medium heat in a large pan. When the oil is hot, add the sausages and brown them slowly. Cook for several minutes, turning them occasionally so they brown on all sides. When the sausages are browned, remove from the pan and set aside to cool. Once cool, slice each sausage into 4-5 pieces. Meanwhile heat oil in a large saucepan over medium-high heat. Add onion, and cook until just translucent, about 3 minutes. Add the mushrooms and garlic. Cook until the mushrooms are tender and the juices evaporate, about 5 minutes. Add tomatoes, sausage and a pinch of salt. Bring to a boil, then lower heat and simmer, uncovered, until sauce has thickened slightly, about 20 minutes. Stir in thyme, oregano, and salt and pepper to taste. While sauce is simmering, cook the pappardelle in a large, deep pot of rapidly boiling salted water until al dente (check package for exact cooking time). Drain. Divide pasta into bowls, top with sauce. Sprinkle with Parmigiano-Reggiano and enjoy.